(Source: http://www.krugerpark.co.za/africa_secretary_bird.html) The Secretary bird is a bird of prey, but unlike other raptors it has long legs, wings and a tail. The single species of its family, the bird gets its name from its crest of long feathers that look like the quill pens 19th century office workers used to tuck behind their ears. The bird is basically dove-grey in color, with black on the wings, thighs and elongated central tail feathers. The short, down-curved bill is backed by an area of bare, red and yellow skin. In addition, the long legs are feathered half way and have the appearance of breeches. The face is bare and the tail feathers are long and shaggy. Standing up to 4ft tall. It's tail has two black central streamers. Its most distinctive feature are the 20 black crest feathers, resembling quill pens stuck behind it's (invisible) ears. The head of the Secretary Bird (with it's yellowish bare patch) and shape of the beak are very similar to those of the caracara. They also have a very long eyelashes. 1. Secretary birds consume snakes, other reptiles, amphibians, tortoises, rats and other small mammals as well as young game birds.Secretary birds pair for life and are remarkably faithful to their nest site. The nest is generally placed low in the fork of a tree, usually an acacia. The huge bundle of sticks grows year by year in the manner of an eagle's eyrie. The two, occasionally three, rough textured, white eggs take about 50 days to hatch, and the downy young are fed on a diet of small mammals. They fly after about eight weeks. During the breeding season there is aggression between the males within a group. Both sexes work together to build a nest. Eggs are layed in May or June and incubated mainly by the female. The young are fed by both parents. Did you ever meet one of these creatures? 2. These birds are basically terrestrial, taking to flight only when hard-pressed. Usually only single birds are found, with members of a pair some distance apart. 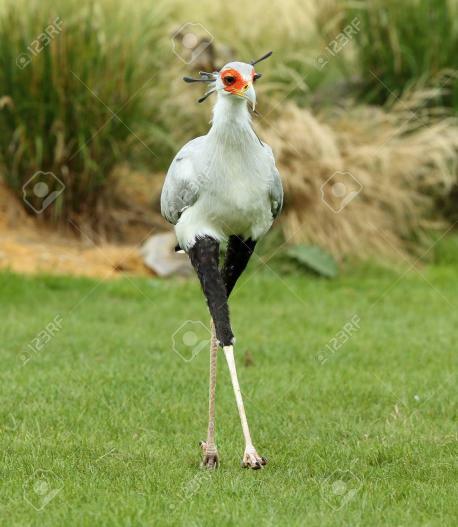 The Secretary bird walks well on extremely long legs, and a bird may plod up to twenty miles in a day. When pursued, it relies on its speed to escape. It finds most of its food on the ground and has a partiality for snakes. It grabs the snake with its strong toes and beats it to death on the ground, while protecting itself from bites with its large wings. Finally, it seizes its prey and hurls it into the air several times to stun it. In South Africa, these birds are kept in captivity to destroy snakes and rats. 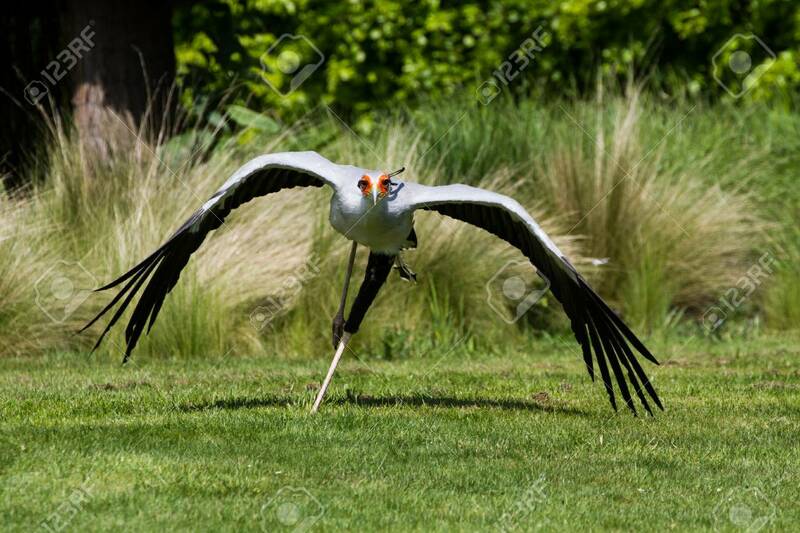 In addition to finding food with its beak, the Secretary bird will also stamp on grass tussocks with its feet to scare up lizards, grasshoppers, and small mammals or birds. 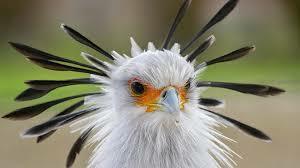 The basic social structure in Secretary birds is a life-long pair. However, they are not particularly gregarious. In fact, members of a pair are usually not together, but instead stay a small distance apart. Are they similar to birds in your area? If there is any resemblance, please let us know the details in the comments below. Thanks. 3. When hunting, it spreads its crest feathers like a fan and seeks food with its short hooked beak. The legs are well protected from bites by a layer of thick scales. 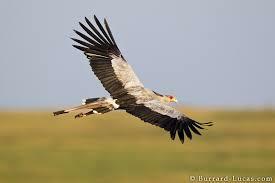 If pursued, the Secretary Bird relies on the speed of its legs but may spread its wings to aid the running. Secretary Birds spend a great deal of time on the ground walking around and searching for prey. Small animals are simply picked up and swallowed. They are opportunistic birds and gather at recently burnt out areas where prey are often injured and without plant cover. Though not a social bird, they often hunt in small groups or pairs, and keep in contact by hooting. Do you consider this bird beautiful? 4. It is found in open areas of plains and savanna country, and often congregates at areas that have been recently burnt, where mammals are deprived of cover and often injured. The Secretary bird is widespread throughout Africa south of the Sahara. Remember that any changes in nature's balance can be very helpful of too bad. We rarely know the outcome till it's done. Would you like to get these birds brought to areas in the US where they could be helpful getting rid of plagues?